Like a lot of Apple fans, I watched the presentation by Tim Cook and Co. last Tuesday about Apple’s new fall product releases. The order that Apple presented their new products was absolute genius. Mac Book Air: Here’s a gorgeous new mobile device. Mac Mini: Here’s a power update to a staple in our product line. iPad Pro: Here’s an update that touches both mobile and power. I’ve been working with an almost 2y old iPad and dual booting off my work laptop for the past 10 months. This is a situation I’d call less than ideal. The recent announcements by Apple have finally got me excited again. So for the past week I’ve been contemplating what I’d like to do to stop leeching off my work’s hardware and using an iPad that’s showing its age. 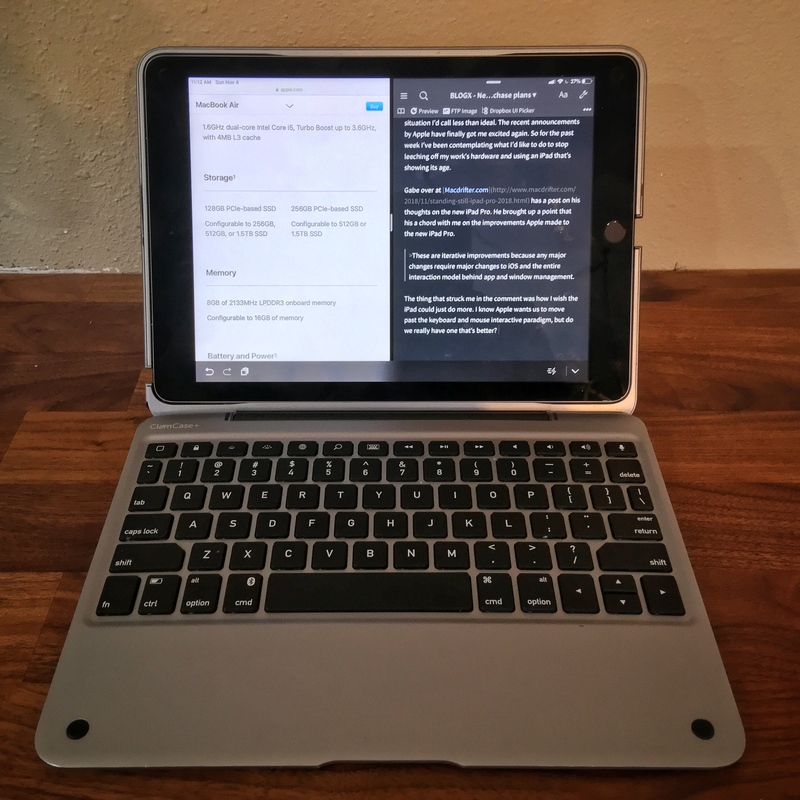 Gabe over at Macdrifter.com has a post on his thoughts on the new iPad Pro. He brought up a point that hit a chord with me on the improvements Apple made to the new iPad Pro. These are iterative improvements because any major changes require major changes to iOS and the entire interaction model behind app and window management. Gabe also referenced a review by Thomas Verschoren that had a lot of the same feelings I had about the iPad. But I think his closing argument said it best. They [Apple] need a more versatile OS. It’s an iPad. Not a bigger iPhone. And I think that’s the part of the disappointment from Apple’s event. Apple gave us an amazing piece of technology, but nothing to make it stand out from the phone I have in my pocket. 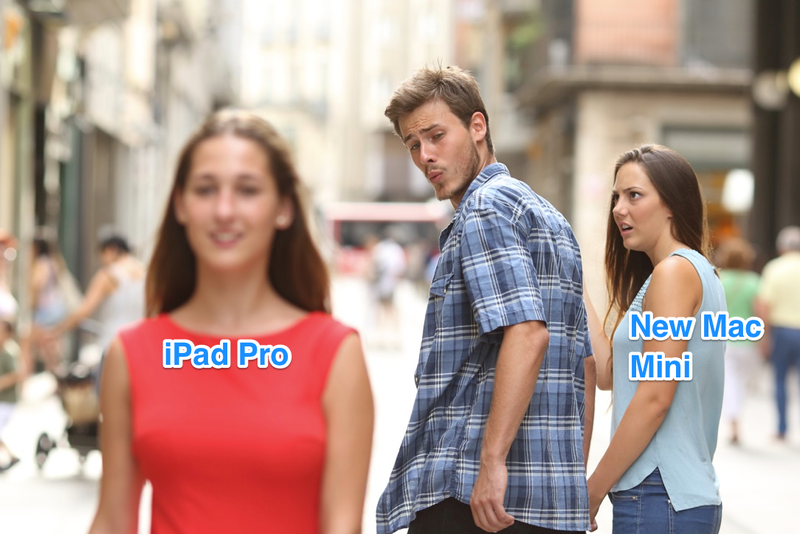 The specs of the new iPad Pro make it on par with some of the best equipment Apple is currently selling, but the new iPad is limited by iOS and the ways we interact with the the iPad. The move to USB-C for the connector is a move I'd hoped would make the iPad Pro stand out against all the other iOS devices. But as reported by The Verge, the connector is limited by the constraints all iOS devices have. But one extremely important category of devices will definitely not work: iOS does not support external storage. You can plug as many flash drives or hard drives as you want into the iPad Pro’s USB-C port, and nothing will happen. Apple says third parties can write apps to talk to external storage, but out of the box, this $1899 tablet simply won’t talk to a flash drive. Those constraints are not just in the accessories but how we can interact with the iPad itself. I have a pencil for my iPad and I love to use it when the app I'm using treats the pencil as more than an expensive screen pointer. I know Apple wants us to move past the keyboard and mouse interactive paradigm, but do we really have one that’s so much better? When you look at the accessories available for the iPad, did you ever notice a lot of them are made to try and make the iPad look like a laptop? Case in point... my current iPad. You know what I do about everyday with this setup? Put my fingers just below the spacebar to move a phantom cursor on my screen. Separate out iOS for iPhone and iPad - The iPhone and iPad are separate devices with separate functions, so they should have separate feature sets. Give us professional features on the iPad - With the USB-C connector available on the iPad Pro, make it work with USB-C devices. If I want to connect directly to a printer sitting on my desk, let me. If I want to import my pictures off of an SD card into Photoshop, let me. Make me want to do my professional work and hobbies on this device. Give the enclosure some love - I know mimicking the competitor is frowned upon by Apple, but adding a built in kick stand to the iPad makes soooo much sense. Apple continues to amaze and frustrate me every time they have a reveal session like this. I think the iPad Pro is on the right track to be an amazing mobile work device.